Someone needs to create a Tumblr account named calmdownmicrosoft because honestly, it does need to tone down its overly ambitious and often obnoxious Windows 10 campaign. While Windows 10 is a major step and a success for Microsoft, some people really appreciate not being pushed repeatedly to install a new operating system. 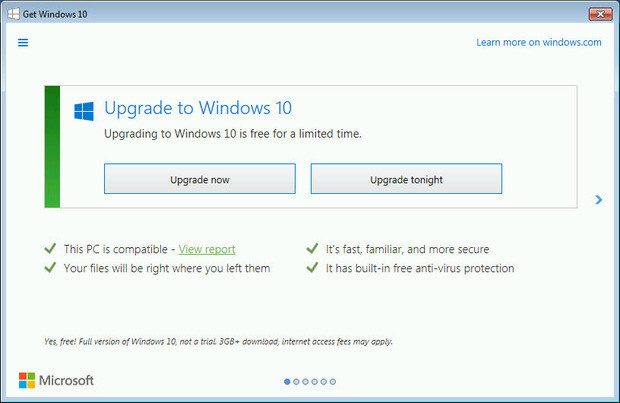 Ever since the release of Windows 10 this year, Microsoft has been trying to get more users to upgrade to its newest OS. It does have to do so to get the numbers up, and more importantly get more consumers on the new operating system as it moves forward to the Windows as a Service (WaaS) model. However, it is equally important to not flood the consumers with a marketing strategy that makes the company look desperate and Windows 10 a product that needs such marketing tactics. It perhaps is working in the favor of Microsoft since even after the user backlash, it keeps pushing them over the edge. Starting from the free upgrade offer within the first year of release, unavoidable upgrade notifications, downloading files in the background, and now a choice that doesn’t even seem to be a choice. InfoWorld has shared the company’s new trick that unfortunately is used more by spammers than the companies of the caliber of Microsoft. As seen above, when clicked on the free Windows 10 upgrade notification in the system tray, it presents you with a full screen ad with only two options of “Upgrade now” or “Upgrade tonight.” No cancel button or even the remind me later button (but then it’d remind even if you don’t ask it) or anything else. You can, of course, cancel it by clicking on the X button in the top-right corner, but it’s evident that Microsoft is resorting to annoying its users so much that they prefer to download the OS than to deal with these notifications. Windows 10 is a successful product with a set of problems that an early stage operating system has to deal with. While there are millions of users who are liking the new OS, there’s also a strong community that prefers to stay with older, more stable versions (like Windows 7) than to try the new waters. These strategies might get Microsoft some weary consumers on the new OS, it definitely doesn’t add any positivity to the company’s image and also has the risk of pushing some users over the edge. So again, how about we create a Tumblr account with tips and memes to calm Microsoft down?